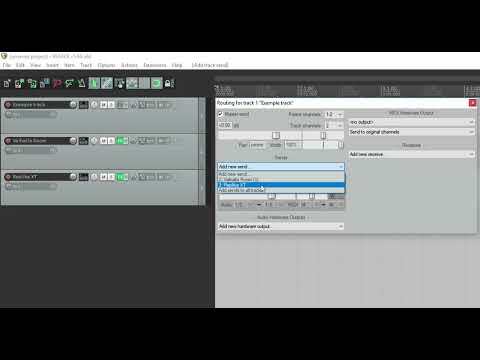 Reaper: is it possible to run reverb and delay VSTs in parallel? I'm proper new to this stuff, includig routing etc. Is it possible to run Valhalla Verb in parallel with Replika XT (Delay)? Right now, I'm only seeig a way to put them in series depending on where they sit in the list of plugins ona track. use them on 2 separate tracks and do individual sends from whatever you want, blend to suit. It should only be necessary to run one track. Invoke two auxiliary Send Busses on that track. Insert the reverb plug-in on one Aux Buss. Insert the delay on the other. Set each plug-in to 100% Wet mix. Govern how much signal reaches each effect with their respective Buss send level controls. @Funkfingers how do I invoke two auxiliary send busses on a track? Is it the same way as dragging from one track to the other like in the video? I am an Apple Logic Pro user. In Logic, the Aux Busses are summoned up from a small pull-down menu box in the individual Track info area. The same task should be possible in Reaper. I will need to research how (and where on the edit screen) Reaper does it. @Funkfingers thanks, I'm unsure how to do it but am hoping it's possible. Seems odd having two tracks to do it. Thank you for your help. I am over fifty. I learned to record and mix on an analogue console. I think of running a reverb and a delay in parallel on the same audio source as a simple matter of connecting hardware signal processors via the aux send and return sockets of the console. In a digital audio environment, the patching cables and hardware processors no longer exist but the thought process remains the same. Thank you mate, 99 bucks, I'm sure Reaper could do it. I'm one track away from a solution...right now it works, but I have 2 tracks doing what should be reasonable enough to do in one. if you put the verb and delay on one track, they will be in series.Put each one on a separate FX track, and use sends/ returns to blend amounts of signal / effect for each independently, thus parallel. Dragging sends around is one way, but each track has a full menu of sends and receives which can be tailored to suit. Edit: I've just noticed that I should have set the mix in Replika XT to 100% wet, but the principal still applies. Video unavailable mate, any ideas if there's any others about? 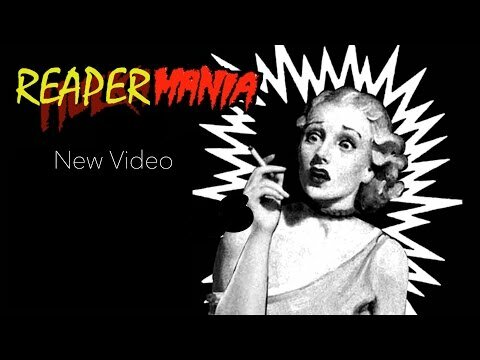 I've redone my video. Does it work now in my original post? Thanks @stratman, that's great. It's how @andy_k described and how I have been doing it since he posted. Was wondering if Reaper has any way of doing it like @Funkfingers describes, using one extra track instead of two. This works though, that's the main thing :-) thanks for your time! I can't think of a way of using a single track in Reaper alone. You can make it look like they're on a single track by using folders, which will also give a master level control for both effects. But it's a bit convoluted and ends up using three tracks, with two of the tracks hidden in a folder . See video below. most modern plugins now use a form of parallel processing internally, eg, reacomp, has levels for dry and wet signal, its just easier to blend at the mix fader level instead of opening up the plugin. I see this as a way of using the 2 effects on one track--do the blend at plugin level, and use one fader for overall level--if you are concerned about using one fader instead of 2, I dont see the problem with 2 faders myself. I set up seperate FX channels for reverb and delay, and use track sends to choose what gets fed into the FX, then use FX fader to blend to suit the track. Also useful to bounce an FX audio track for export, just be a bit careful with pre-post fader settings. I love Reaper more the more I use it. @stratman how's Valhalla Room? Any good? How different is it from VVV? I haven't done a detailed comparison to be honest. 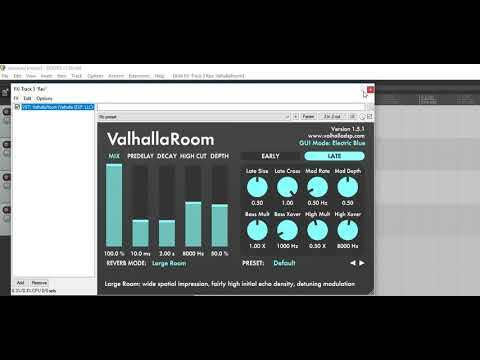 Valhalla Room is my go to reverb, which I always start with. Then I experiment with Valhalla Vintage and Plate if I can't quite find what I want with Valhalla Room. Nice one, I may just get it then! As @Funkfingers has stated, the conventional way to do this is with Aux sends, whether digital or analogue. Advantages - each mix channel has access to the effect by turning up the appropriate knob, you only need one instance of the plug-in thus saving Processing Power, and you will get a more realistic room reverb, for example, if all sounds are being treated by the same reverb, similar to what happens in a real room. Also you can have a stereo effect being accessed by mono signals which is going to sound stereo-er than having the plug in as an insert on a mono channel. It is possible to put both reverb and delay on the same aux channel, but you then lose individual control for no benefit. My aux return channels always stay at 0dB, I vary the amount of fx on the source with the aux send knob. Of course there are exceptions to every rule, but generally time based effects like reverb, delay and chorus go on an aux send/return loop whereas processors like compressors and eq's go on channel inserts.